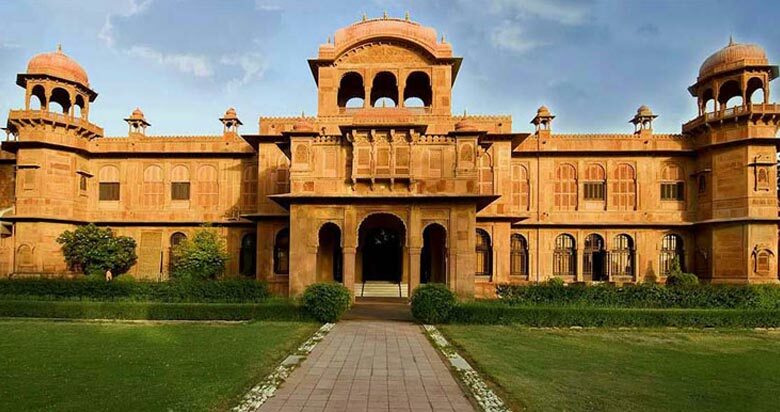 Palaces of Rajasthan is a special interest tour focusing on highlighting the architectural gems of the state resting in the form of its forts, palaces, merchant mansions or havelis. 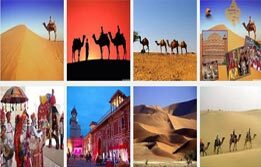 But what sets Rajasthan apart from other tourist destinations in India are its old world charm and its love for art and culture. 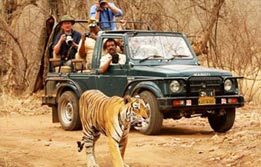 During Palaces of Rajasthan tour, a tourist besides receiving conventionally enriching experience in the state gets to be a part of rural India of yesteryears and its splendid heritage in dreamlike castles of kingdoms. Upon arrival in Delhi international airport, meet India Budget Tours representative who will assist the transfers to the hotel for overnight stay. 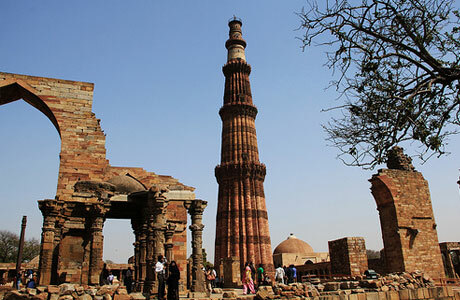 After breakfast, begin the sightseeing tour of Delhi via the splendid heritage lane. In morning, visit the lanes of Old Delhi or Shahjahanabad, the city established by Fifth Mughal Emperor Shah Jahan. Ruled by the stately 17th century Red Fort and overlooked by a marketplace called Chandni Chowk and a mosque, Jama Masjid, this part of Delhi is lined with heritage havelis and narrow alleys. Still, this is one of the most prominent attractions of visiting Delhi. Continue Old Delhi tour with a visit to Raj Ghat, a memorial marked on the spot of Mahatma Gandhi’s cremation site. 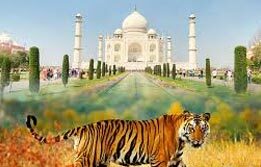 In the noon time, begin a tour to New Delhi, which has its own Victorian charm. Designed by Sir Edward Lutyens, this city’s core is characterized with wide tree lined boulevards, parks and fountains surrounding the imposing government and stately buildings. A drive past the President House / Rashtrapati Bhawan is seen as a great attraction here. Later visit Humayun's Tomb, dedicated to second Mughal Emperor Humayun and Qutab Minar, the first Islamic monument in India. Return to hotel for overnight. 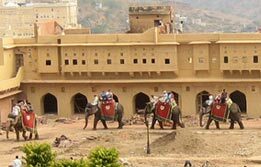 Move ahead to Samode (270 Kms / 7 hrs), a landlord town near Jaipur with Palaces in Rajasthan Tour. Here, you will stay for two nights at a heritage property, Hotel Samode Palace. Check into hotel. 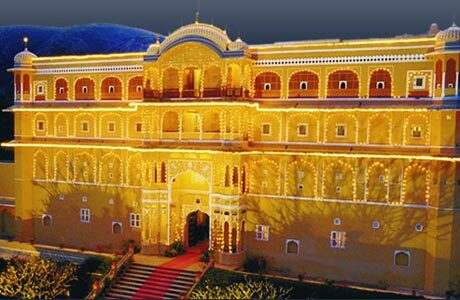 In afternoon, visit Samode Palace, Samode Bagh, Sultan Mahal and Hall of Mirrors, the attractions of the property. Overnight in Samode. 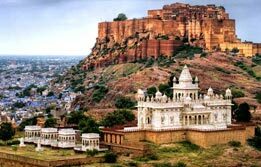 After breakfast, begin an enchanting excursion to Amber, the medieval fort of Rajputs. This formidable hill fort provides an experience nonpareil to the tourists. One such rare attraction here is making the ascent atop the royal elephant’s back. The extravagantly decorated halls and chambers are other attractions here in Amber fort castle. 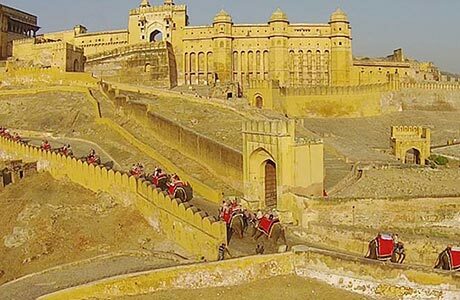 After the excursion is over, continue the excursion to the Pink city Jaipur known for offering tourists its share of royalty in the form of forts, palaces and monuments. 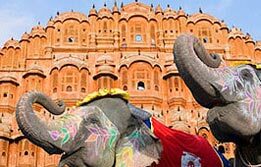 Jaipur’s sightseeing includes a visit to the Hawa Mahal - the Palace of the Winds, City Palace and Jantar Mantar Observatory. Evening is free for shopping. Overnight in Samode. In the morning, drive to Mandawa, the open art arcade (160 Kms / 4 hrs) and check-in to the hotel. This afternoon begin a walking tour of Mandawa's painted havelis. The outer walls of this Shekhawati town are equated with metaphors like open illustrated story book courtesy the bright and elaborate murals. Every piece painted on wall is an art-de-resistance in this town of Rajputana. Overnight in Mandawa. After breakfast, continue journey onward with a drive (200 Kms / 5 hrs) to Bikaner, a baked desert city of Rajasthan, pictured for its beautiful deserts. Upon arrival, check into hotel. In the noon, visit Junagarh Fort, Lalgarh Palace, various temples and the only camel breeding farm in Asia. Overnight in Bikaner. 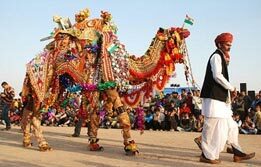 Drive to Jaisalmer (250 Kms / 6 hrs), and check-in the hotel for a two night stay. Afternoon head out to the golden desert stretch and watch the sunset over the timeless dunes. Meanwhile, enjoy a short camel ride at Khuri Village. Overnight at hotel. After breakfast, devote another day to the discovery of Jaisalmer, pictured worldwide for its Golden Fortress, Jaisalmer Fort rising from the honey hued desert. Continue city tour via a visit to the famous Jain Temples of Jaisalmer dedicated the 16th Tirthankara, Shantinath, and Parshva, the 23rd Tirthankara. 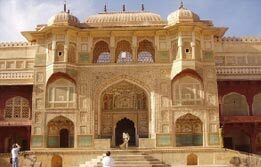 Continue the desert city tour via a visit to various Havelis, Gadi Sagar Tank, museum and Jaisalmer Fort. Overnight at hotel. Devote the day’s journey (280 Kms / 6 hrs) to Khimsar, a heritage town famous for its royal remnants in the form of a fort. Upon arrival, check in to the hotel. Begin an afternoon safari around the village. Overnight in Khimsar. Travel to Ranakpur today (290 Kms / 6 hrs) and check in at Hotel for an overnight stay. 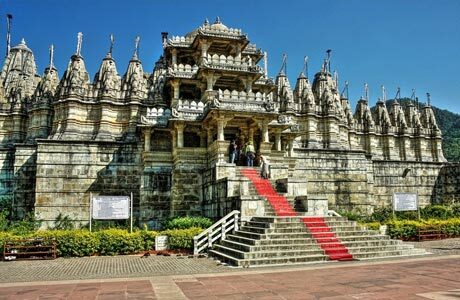 This is a remarkable temple town known for its immaculate Jain temples. Carved of marble, these temples are one of the five great holy places dedicated to Jain faith. Overnight in Ranakpur. After breakfast, explore the Kumbalgarh Fort and continue onward journey to Udaipur (90 Kms / 2 hrs) where you will be staying for a night. The remaining day is free at leisure. Overnight in Udaipur. Begin morning tour of Udaipur via a visit to picturesque Lake Pichola. This rules the city with an idyllic setting including its many waterfront palaces. Begin boating in this lake. 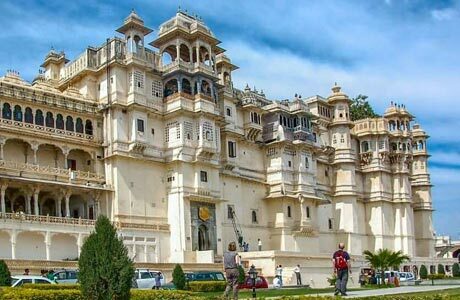 Later, visit City Palace, Jagdish Temple, Bhartiya Lok Kala Mandir and Sahelion-Ki-Bari during Udaipur city tour. Afternoon continue the excursion to Eklingji and Nagda Temples. Overnight in Udaipur. 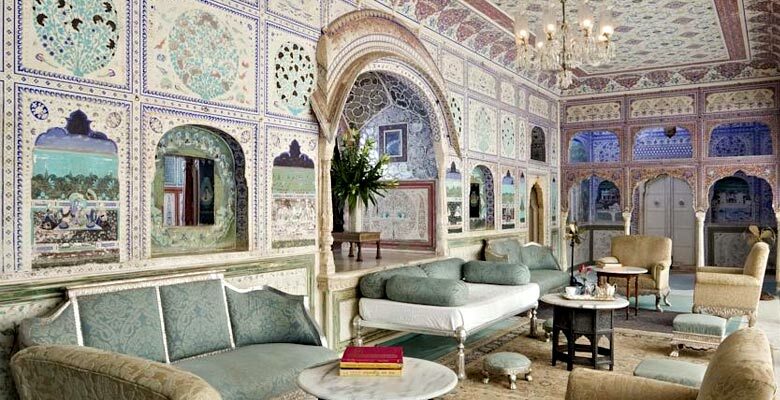 Check out Udaipur and board a flight to Mumbai. Upon arrival, check into hotel. In the noon, begin a Mumbai city tour. Visit Prince of Wales Museum, Marine Drive, Victoria Terminus (Shivaji Terminus), Flora Fountain, Crawford Market, Nehru Planetarium, Kamala Nehru Park, Hanging Gardens, National Gallery of Modern Art, Chowpatty Beach etc. Overnight in Mumbai. After breakfast, begin a cruise towards Elephanta Islands (9 Kms) to see huge rock cut temples. Later drive to airport to connect flight for onward destination. Aircon Standard Car (Tata Indigo) for all transfer and sightseeing as per itinerary. 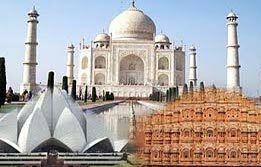 English speaking guide at each places as per the itinerary during sightseeing tour.